Translation services are used by both governments, business, and individuals who try to bridge the communication gap that exists between two entities speaking a different language. Statistical data shows that the global language services amounted to more than $40 billion in 2016 and are forecasted to reach $45 billion in 2020. According to the 2019 U.S. Industry Statistics & Market Research – Translation & Interpretation Services in 2018 the U.S. federal government spent a total of $5,845,925,338 on Translation & Interpretation Services. This data is impressive and is indicative of the importance of professional translation services. As a client, you may be surprised to find out how many different types of translation services actually exist on the market. We can briefly differentiate between machine and human translation, as well as between general and specialized translation. In case you need to use professional translation services, however, it is necessary not only to know how to select the best language service provider but also which type of translation is suitable for your particular case. The article below will outline the most common types of translation services and help you make a more informed decision next time you approach a Translation Provider. A translation agency or Language Service Provider (LSP) is a specialized entity that provides language services. An agency usually employs a team of interpreters with different language combinations and thus can offer a broader variety of services. Some translation agencies specialize in the translation in a given field or industry – law, medicine, finance, while others cover a broader range of content. The benefits of using a translation agency come with the fact that you will have a single point of contact for your translation project. There is usually a Project Manager in charge of each client who facilitates communication and makes sure the process goes smooth from beginning to end. It is of particular convenience for companies who often translate larger number of documents into several agencies. The translation services almost always include editing and proofreading through an established QA system. There are many qualified translators that prefer to work for themselves and you can contract them for your translation project. The benefit is that you communicate directly with the person and you can usually expect personalized treatment. You can get freelance translators from all over the world and thus search for the most appropriate translation offers in terms of quality/price ratio. There are freelancers who specialize in certain fields, and some who offer general translations only. One of the disadvantages is that you may need to find another freelancer for proofreading your translation. In case you need a text translated in several languages, you will have to contract several freelance translators which may be not as convenient in terms of communication or delivery time. Human translation is the oldest and still the most reliable form of translation. To become a translator, it is not enough to simply be bi-lingual or speak a foreign language. There are special educational programs that help translators gain some of the expertise they need for the job. The years of experience are also a significant factor, that facilitates performance. Human translation is reliable, accurate, and high quality. It is the best form of translation when it comes to translating highly-specialized texts and documentation. Human translators are always preferred for localization project as they can give the translated text the local flavor necessary to differentiate it and make it relatable to the target audience. Human translation is used by both commercial institutions and individuals for the translation of official documents or sensitive content. It is also the leading option when it comes to translating your content from or into a rare language. The idea of machine translation (MT) dates back from the 17th century when Rene Descartes proposed to create a universal language using one symbol for similar ideas in different languages. Actual MT was introduced in the 50s of the 20th century but didn’t gain much popularity then. Now, machine translation has evolved significantly and is actively employed by both business organizations and individuals. It is necessary to differentiate between the different types of machine translation, though. There is free MT in the form of apps that is primarily used by individuals who are traveling abroad or need some piece of information translated from one language into another. One of the most popular services is Google Translate, which was launched in April 2006. This type of MT is often inaccurate and can even produce gibberish, funny or totally inaccurate translations. In the last few years, free MT saw a significant improvement and today the service is quite reliable for non-professional use. It still depends on the language combination though. MT between popular languages like English and Spanish is much better quality compared to more complex or rare languages. There is specialized software for machine translation that is employed in professional translation services by both translation agencies and freelance translators. It produces translations with higher quality than the free apps and is extremely useful for projects involving a significant volume of written text that needs to be translated. Machine translation is usually cheaper than human translation but cannot compare to it in terms of accuracy and cultural appropriateness, for example. Machine translation is suitable for certain industries like the travel industry, for example, and not for all type of content. It should be pointed out, that MT translation evolves rapidly with the technological innovations. Deep learning facilitated the appearance of neural machine translation (NMT), which has the potential to offer higher accuracy in translation. While the possibilities and benefits of NMT are great, it is still far from replacing human translation. Blended translation or machine-assisted human translation gains popularity in recent years as it combines the two approaches to provide a more affordable service with higher quality than simple machine translation. In this case, the bulk of the content is translated using a specialized MT tool. Then, the text is edited and proofread by human translators who make sure that it meets the client requirements. The human touch adds accuracy and quality to the translation. 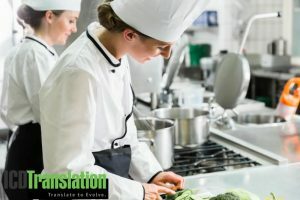 This form of translation is often preferred by companies who have a limited budget for translation but a huge amount of content to be translated. The service also saves time as the turnaround period is much shorter in most of the cases. Most of the machine translation services offered by LSPs are actually blended translation services that include a machine language translator and human translation editing. Translation services can also be divided depending on the content of the translated text. Most of the agencies offer translations in several fields, while others serve only specific industries. In case you need a highly specialized translation, it is better to approach a provider, an agency or a freelancer, that have substantive experience and knowledge in the given field. This is the most basic type of translation that deals with non-specialized content. The language in such texts is usually that of the everyday communication. No specific knowledge or expertise is required by the translator. Quite often we are required to present a certified translation if we want to apply to a foreign university or when dealing with foreign business partners. Many people are not aware what exactly stands behind the term certified translation. The truth is that any agency or translator can certify a translated document. They simply need to put a signed statement on the bottom of the text, in most cases, that attests the accuracy and completeness of the translation to the best of the translator’s knowledge. The statement contains information as the title of the text, number of pages, source and target language and is followed by the translator’s signature and/or the company’s stamp. Some countries require the translation to be notarized by a notary public as well in order to qualify as certified translation. Literary translation is often perceived as the most difficult type of translation as the translator faces the challenge of rendering the author’s unique style of writing into another language. Literary translators deal with semantics, cultural differences, word play, tone of the text, rhythm. There is a specific competition for literary translation called translation slam, where two translators compete to show who can best translate an author. The texts can be prose, poetry, or comics. Technical translation can refer to translating user manuals, product descriptions, leaflets, administration documentation and the like if used in its broadest sense. More specifically, technical translation can be used to denote the translation of technical documentation in the sphere of IT, mechanics, electronics. In both cases, the translator needs to have substantial knowledge of the industry to which the text relates. Medical translation can also be called pharmaceutical translation and includes the translation of various types of documents and content in the medical sector. Medical translators need to have extensive knowledge in the field. Some of the documents to be translated include medical publications, medical records, medicine packaging, prescriptions, results of clinical research and the like. Judicial translation that includes documents such as letters rogatory, depositions, minutes of interrogation settings, judgements or other documents related to court proceedings. Juridical translation that covers the translation of laws, legally binding contracts such as labor contracts, partnership agreements, conventions and the like. Financial translation includes the translation of financial texts and documents related to banking, financial management, asset management, stocks, bonds, etc. We can call this type of translation professional business translation as it deals with translating documents that facilitate the running of a business or can be found in a company or government institution. It deals with a great number of administrative documents such as reports, tender documentation, business correspondence and many more. Website translation is essential for any business that wants to expand internationally. It involves translation and localization of all of the content on the website including individual product pages, videos, blog posts. In order to make your website translation a success, you also need to think about additional elements such a sound SEO strategy in addition to the actual translation of the content. E-learning localization is also often utilized for company trainings. The goal is to provide consistent information to all employees regardless of their physical location and trying to have the content adapted to their understanding. Last but not least we need to pay special attention to localization services, which quite often coincide or occur simultaneously with the translation services. Localization is a very important part of the overall service provided by LSPs as it guarantees that the content is not simply rendered from one language into another but properly localized taking into account the peculiarities of the local customers and their culture. Localization is often used by companies who want to expand globally and look for the best way to present their website, product or service in the new market. Software localization is another popular service for the business. It is a form of specialized translation that often requires collaboration with a software developer to guarantee the high quality of the final product. Choosing the right translation partner is the key to a successful translation regardless of its purpose or size. It is vital to know what you want in terms of translation, so that you can find the right provider and negotiate the best conditions for each individual translation that you need.